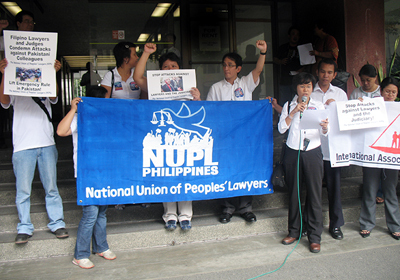 MANILA — A ranking official of the Armed Forces of the Philippines (AFP) on Saturday called on National Union of People's Lawyers (NUPL) president, lawyer Edre Olalia, to stop defending the Communist Party of the Philippines-New People's Army (CPP-NPA) after the latter denied that their group have links with the communist group. Deputy Chief-of-Staff for Civil-Military operations, Maj. Gen. Antonio Parlade Jr., dismissed Olalia's claim that the NUPL offers its free legal services to poor clients. "Look at your records and tell me about all those high profile communist terrorist cadre clients you have been defending ever since. Are they poor with the billions they are all getting from extortion, from foreign NGOs you have duped, EU, Belgium and who knows from whom else?," Parlade said. Parlade was reacting to a Facebook post of Olalia on Friday, describing the former’s linking of the NUPL to the CPP-NPA as "wild, malicious and actionable allegation." Parlade was unfazed by Olalia's threat of suing him in court. "Now when your other CPP front organizations are exposed, like Ibon, Karapatan, Gabriela, Bayan, Bayan Muna, Kilusang Mayo Uno, and they cannot take the challenge because of the evidences they know we have, you threaten me?," he said. "Not this time Olalia. Fifty years of threat is too much. The whole nation is awake, finally. This time the entire bureacracy, the NTF ELCAC (National Task Force to End Local Communist Armed Conflict), including the judges and prosecutors you have deceived with your fake advocacy, are actually sitting down to make a final push to crush this insurgency," he added. Parlade also pointed out the "selective justice" being practiced by Olalia and his group. "Think of the thousands of activists your uncle Joma sent to the mountains upon the declaration of Martial Law after your CPP colleagues bombed Plaza Miranda. Will they ever get justice from your deception and propaganda? What about the 9,000 or so who perished from your CPPs purging during Oplan Ahos, Oplan Zombie, Oplan Kadena de Amor, Oplan Missing Link and Oplan VD? Did you ever fight for them in the Kangaroo Courts? Or any court for that matter?," he added. Parlade said the communist rebels become poorer because of the revolution by the CPP-NPA.